The APC United Late Model Series continues to grow in popularity across the province and into other parts of Canada and the United States after two wildly successful seasons. The series is set for another thrilling season in 2017, which will feature many familiar events over the summer months and a few changes that will bring the series to new heights. 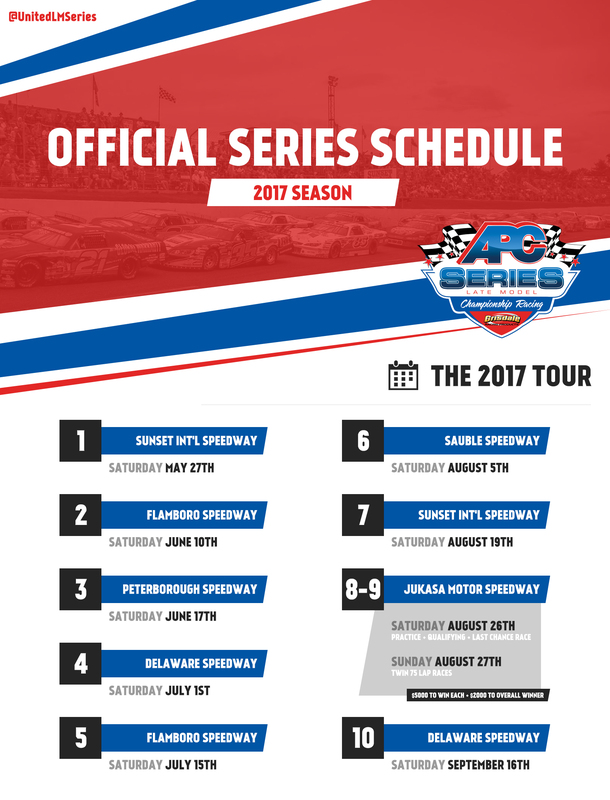 The APC Series will begin its 2017 tour at Sunset International Speedway for the third time in as many years. The date has been pushed back to May 27th as series officials pursue better weather for race fans and teams. After the season opening event the tour will head to Flamboro for its first of two scheduled events at the track on June 10th. The APC Series will then travel to Peterborough Speedway on June 17th for its annual event, which will come a month earlier than normal. The Series will celebrate Canada’s 150th birthday at Delaware Speedway on July 1st for the fourth event on the 2017 tour. The afternoon show will allow race fans to get to their favourite firework venue at night, completing a great day of celebration in our great country. The halfway point in the schedule will see the series revisit the tight confines of Flamboro Speedway for its second race of the season. Sauble Speedway’s long weekend late model tradition will continue on August 5th with the annual Beat the Heat 100 before the series heads back to Sunset International Speedway on August 19th, a race that has seen major championship implications in the previous two seasons. The last portion of the season will see a major change as the series heads to Jukasa Motor Speedway on August 26th and 27th for the track’s reopening weekend. The newly renovated track, formerly known as Cayuga Speedway, will host back to back days to celebrate its grand reopening in a large way. Saturday the 26th will feature practice, qualifying and the last chance race before Sunday’s big twin 75 lap events, a series first. Each race will have $5000 on the line for the winner, with a $2000 bonus on top for the overall winner between both races. After the historic trip to Jukasa Motor Speedway, the series will head to Delaware Speedway to crown its 2017 champion as a part of the famed Great Canadian Race Weekend. For the third straight season the track will host the finale and crown a Great Canadian Race winner, adding to the legendary list of names. The series championship race will be the 10th of the season, one more race than the previous season. The 100 lap season concluding race is sure to be as exciting as ever as a full field battles for the race win and championship contenders battle each other for the title. “With the Great Canadian Race being one of the biggest races in Canada and late models being a big part of the tradition, it seemed like a natural fit for the APC series to be a part of the weekend with the way the series is run in a professional manner,” said Delaware Speedway General Manager Jonathan Urlin.